When you think of Japanese cherry blossoms, Washington, D.C., comes to mind—but Philadelphia isn’t far behind the capital in enjoying these harbingers of spring. More than 1,000 cherry trees (sakura in Japanese) grace its streets and parks. Many of them were planted in 1926 as a gift from the Japanese government in celebration of 150 years of American independence. Since 1998, the city’s Japanese American Society has been tending the trees. Each spring, when the trees bloom, thousands of Philadelphians and tourists flock to the city’s Cherry Blossom Festival, a two-week-long celebration of Japanese art and culture, honoring the friendship between Philadelphia and Japan. This year, on April 5, Sakura Sunday, the culmination of the festival, more than 50 students from the taiko drumming ensemble as well as members of this spring’s two taiko classes and last fall’s Japanese dance class headlined the day’s events on center stage at the Philadelphia Horticulture Center in Fairmount Park. 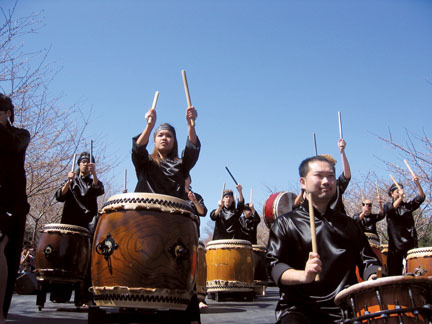 Under a cloudless sky, three taiko ensembles, a kabuki group, and a folk-dance group gave two performances each, to crowds of spectators that peaked at 40,000 (twice as many as at last year’s Sakura Sunday). Joe Small ’05, a former member of Swarthmore Taiko who received a Fulbright Fellowship to pursue taiko research in Japan followed by a two-year apprenticeship with world-renowned taiko ensemble Kodo, joined the students onstage. The performances were directed by Isaburoh Hanayagi, director of the Taiko Drum and Dance Ensemble at Tamagawa University and former Julian and Virginia Cornell Distinguished Visiting Professor of Japanese Dance, and Associate Professor of Dance Kim Arrow.